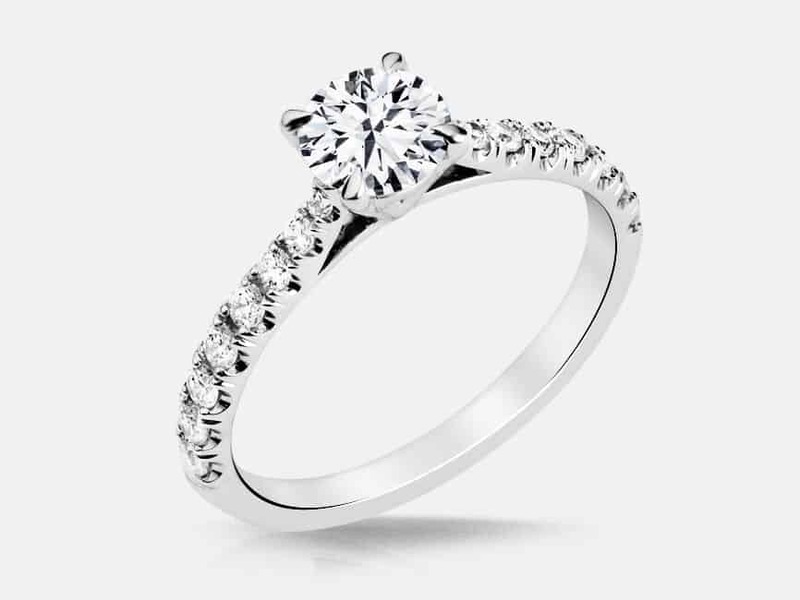 [/vc_column_text][/vc_column][/vc_row][vc_row][vc_column][vc_custom_heading text=”Unique Round Cut Engagement Rings” font_container=”tag:h1|font_size:52px|text_align:center|line_height:100%25″ use_theme_fonts=”yes” el_class=”cardo title-mp-remove”][vc_empty_space height=”70px”][/vc_column][/vc_row][/vc_section][vc_section][vc_row][vc_column width=”2/3″][vc_custom_heading text=”You want a engagement ring that’s as gorgeous as she is. 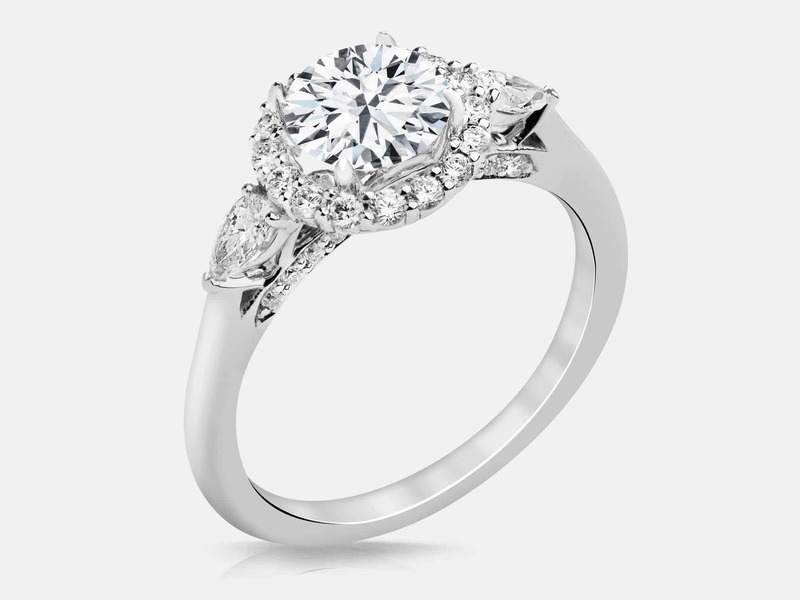 Our beautiful, ethically sourced round brilliant cut diamonds are sure to please. With the guidance of our artisans, you can’t go wrong.” font_container=”tag:p|font_size:36px|text_align:left|color:%2390856b|line_height:120%25″ use_theme_fonts=”yes” el_class=”cardo title-mp-remove”][vc_empty_space height=”50px”][vc_custom_heading text=”The round brilliant diamond cut engagement rings we offer:” font_container=”tag:p|font_size:36px|text_align:left|line_height:120%25″ use_theme_fonts=”yes” el_class=”cardo cardo-bold”][vc_column_text]We have a large collection of round brilliant cut diamond engagement rings in a range of styles. 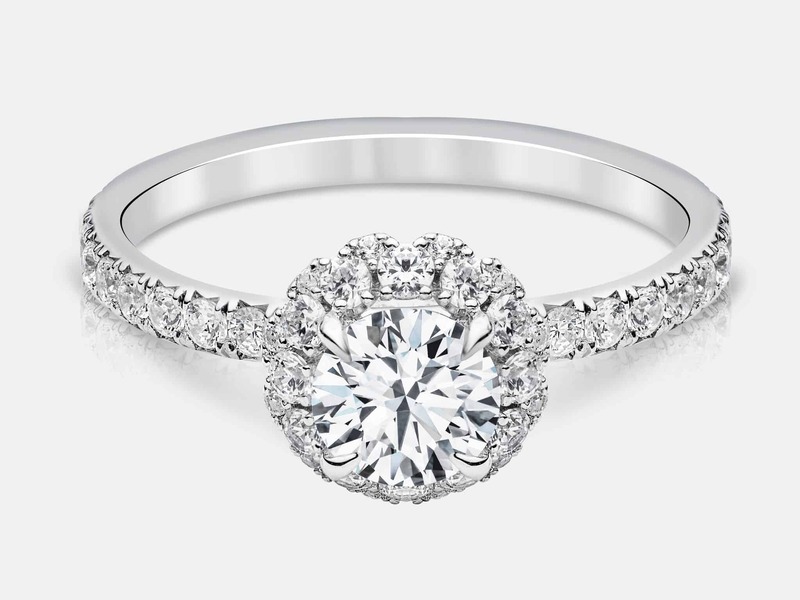 With the expert guidance of our staff, you’ll be able to find the ring that perfectly complements her. 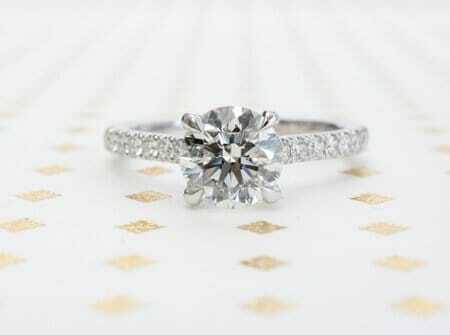 You want a ring you can both take pride in. 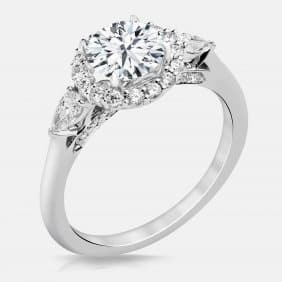 The wide range of round cut diamond engagement rings we have ensures there’s something perfect for her. 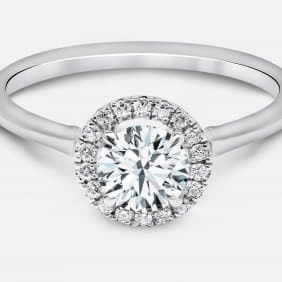 [/vc_column_text][vc_custom_heading text=”Round Brilliant Cut VS Old European Round Cut” font_container=”tag:h2|text_align:left|line_height:120%25″][vc_column_text]When discussing round brilliant cut diamonds, it is important to understand the difference between older styles and the more modern brilliant round cut. 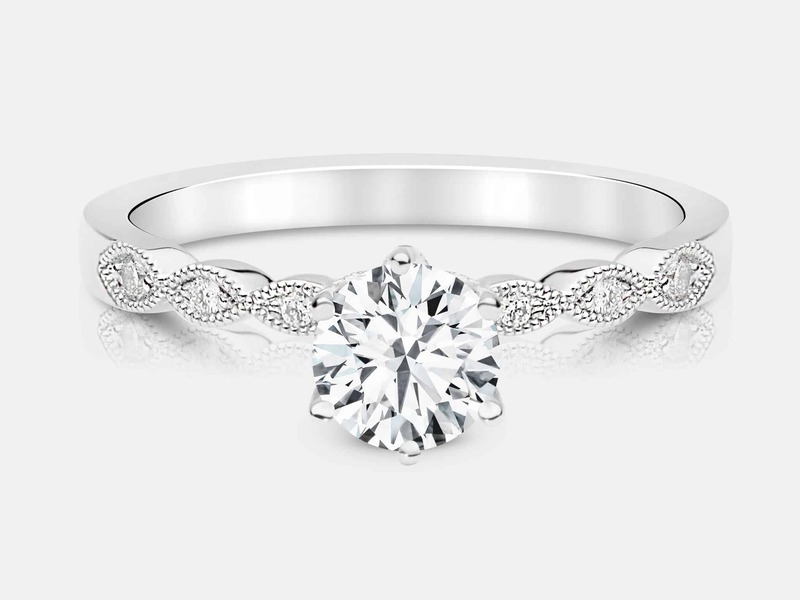 Both of these can be called round cut diamonds but there are some significant differences. The original old European round brilliant diamond was made in a time where there was lower access to high quality diamonds. With newer technologies making the perfect cut easier to achieve, along with a more plentiful supply, we now have the ability to cut diamonds to maximize their beauty. Because of this, instead of being cut to maximize brilliance, they were specifically cut to enhance colour and clarity. 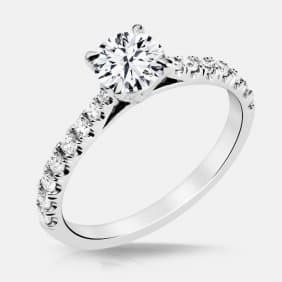 [/vc_column_text][vc_custom_heading text=”Characteristics of the Round Cut Diamond Engagement Ring” font_container=”tag:h2|text_align:left|line_height:120%25″][vc_column_text]Unlike princess cut diamond rings, the round brilliant cut consists of 57 or 58 facets (including the culet) and offers exceptional light reflection, also known as brilliance. These diamonds are exceptionally popular, making up the bulk of the diamond industry. 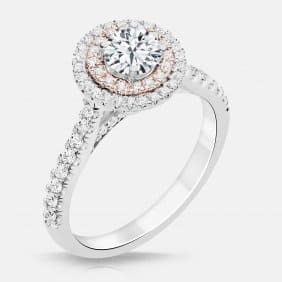 However, because of the fact that cutting a brilliant round cut diamond results in the highest amount of lost rough diamond weight, they are also quite expensive. 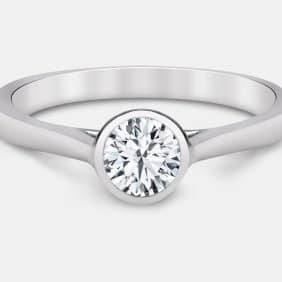 [/vc_column_text][vc_custom_heading text=”Why Choose a Round Cut Diamond Engagement Ring” font_container=”tag:h2|text_align:left|line_height:120%25″][vc_column_text]There are a lot of great reasons you should consider a round brilliant cut diamond. Their radiant beauty is unmatched by any cut. 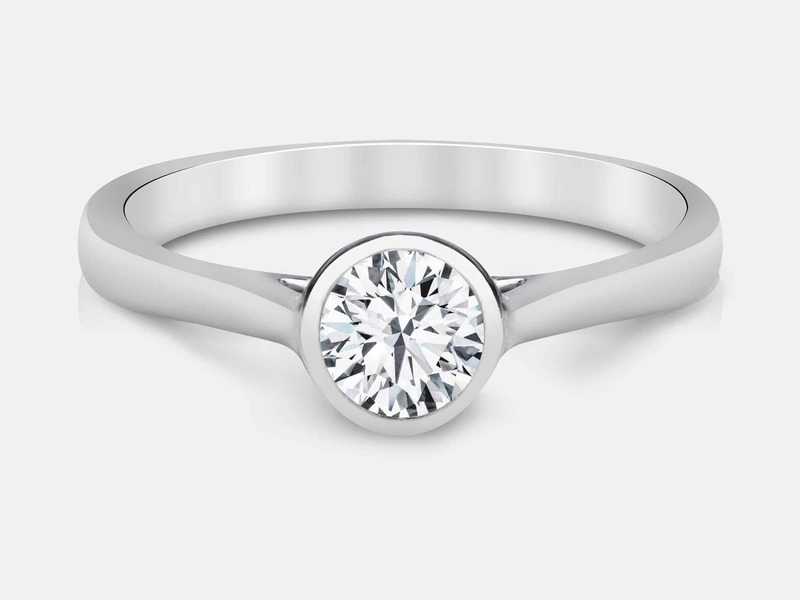 Whether used in solitaire, or accented by other supporting diamonds, the sheer brilliance of the round cut is what makes it so popular. While it does have a higher price, this can be partially circumvented through careful shopping and a bit of knowledge. 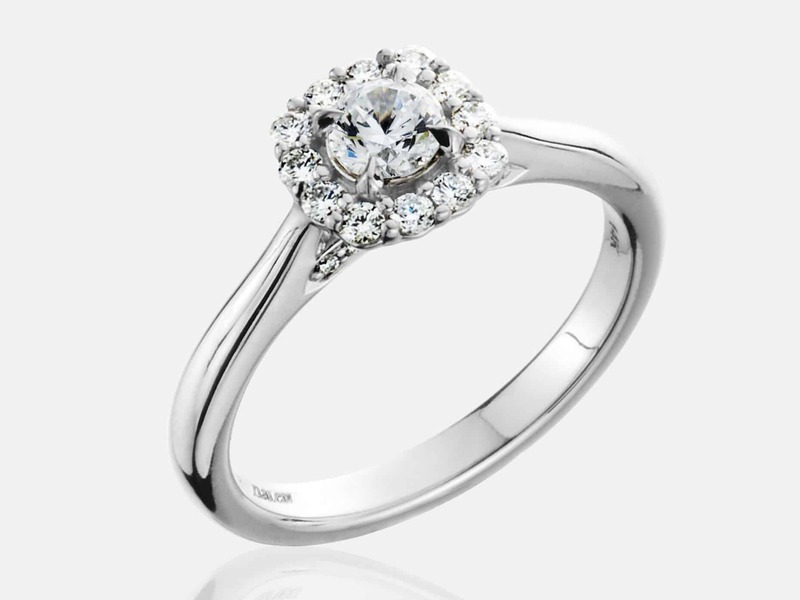 When choosing a diamond, you can be safe going for an eye clean quality. This means that while there are flaws, they cannot be seen by the naked eye. As a result, they will not be noticed, giving you some savings. Another way to do so is to plan your setting first. By having this planned ahead of time, you’ll know what areas of the diamond will be covered by the ring. As a result, you can get a stone with flaws in those areas, as they will be blocked from view. This can lead to a lot of savings. 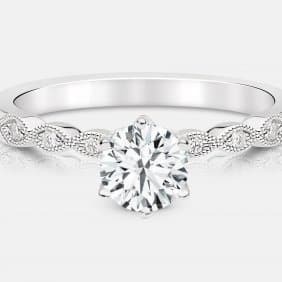 [/vc_column_text][vc_custom_heading text=”The History of the Round Brilliant Cut Diamond” font_container=”tag:h2|text_align:left|line_height:120%25″][vc_column_text]Traditional round cut diamond rings have been around for many years. However, the old european style evolved in the early 20th century. In 1919, Marcel Tolkowsky sparked a wave of interest in the Round Cut Diamond by publishing his work, “Diamond Design: A Study of the Reflection and Refraction of Light in Diamond” which went into detail of the ideal cut for a round brilliant diamond. 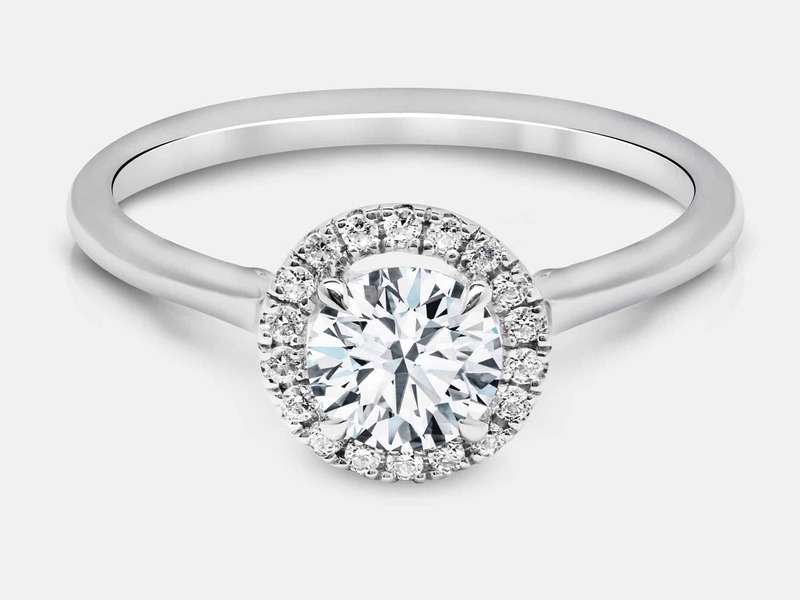 Since Tolkowsky’s influential piece was written, the round cut diamond has remained the most common cut. Before the 20th century, during the Edwardian, Art Deco and Victorian eras, the Old European cut style was popular. As knowledge and technology improved, diamond cutting techniques became more advanced. Cut design shifted toward larger tables, smaller culets, and longer, leaner facets. 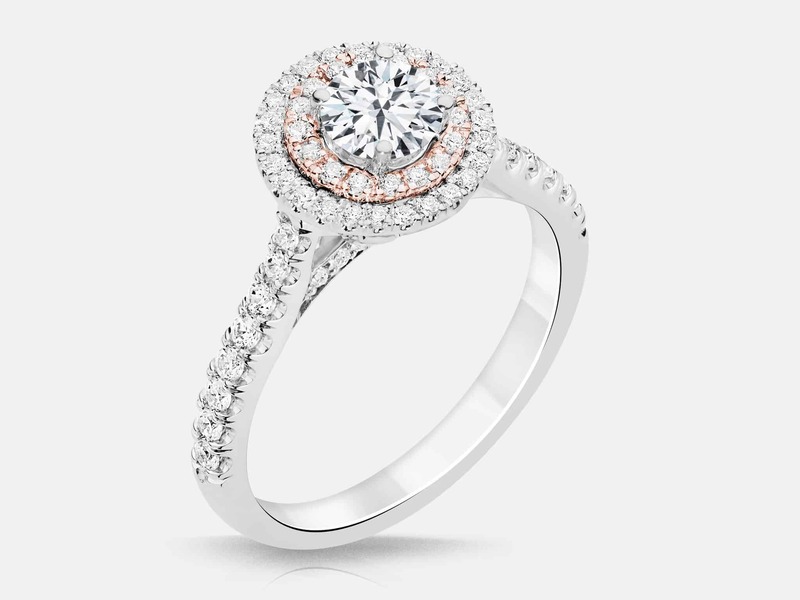 While old European style diamonds were cut primarily for color, the round brilliant is now cut for its fiery glow and light performance. 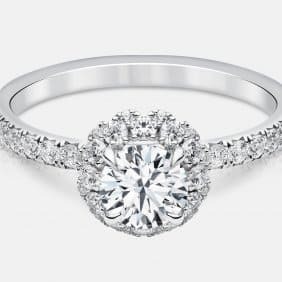 [/vc_column_text][vc_custom_heading text=”Why You Should Choose Our Unique Engagement Rings” font_container=”tag:h2|text_align:left|line_height:120%25″][vc_column_text]You want the best. That’s why our passionate team of skilled artisans are always available to guide you through the process. 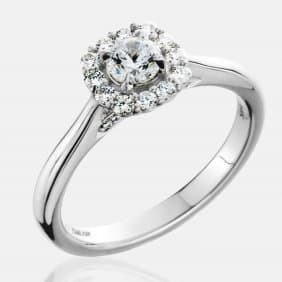 We can show you a range of different diamonds and rings to help you along the selection process. With their guidance, you can’t go wrong. We also provide third party valuation so you know the true value of your selection.